At exit 164A, turn right onto the ramp, but stay left and merge onto the Dearborn St./James St./Spokane/Madison arterial. Keep left to stay on the ramp. Once on the arterial, get in the right hand lane, and take the James Street exit. Turn left onto James Street, underneath the freeway and down toward the water. Turn North (right) on First Avenue. The office is located in the historic Colman Building, which is 2 blocks to the North on the left hand side, on the Northwest corner of First and Columbia. Parking is available one block to the South near US Bank, or on the other side of First Avenue in the Norton Building. From Southbound I-5, take exit number 165A, also known as the "James Street," exit. This will lead you out onto 6th Avenue. Turn right onto James Street and proceed down toward the water. Turn North (right) on First Avenue. 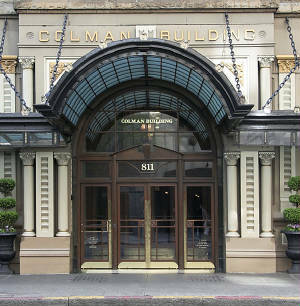 The office is located in the historic Colman Building, which is 2 blocks to the North on the left hand side, on the Northwest corner of First and Columbia. Parking is available one block to the South near US Bank, or on the other side of First Avenue in the Norton Building.